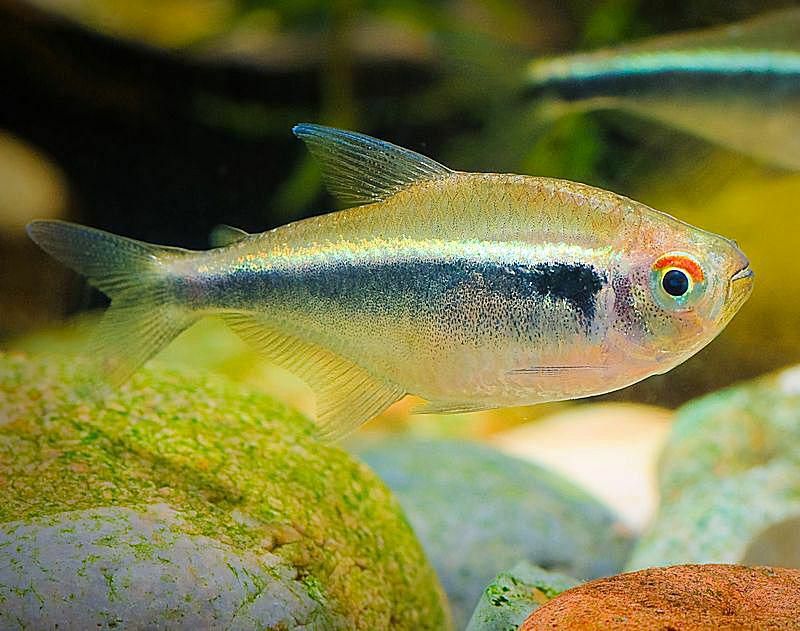 The black neon tetra is an energetic fish with a pleasant personality and it is easy on the eyes. Put this fish among contrasting plants and a dark background and you will have a vibrant and beautiful aquarium. The black neon tetra has been successfully bred in captivity, and most black neons available for sale for the aquarium trade are all captive-bred. It is native to the Paraguay basin of southern Brazil. Black neon tetras are now generally all captive-bred and there is an albino form that is also sometimes available. In the wild, these fish prefer small tributaries, creeks, areas of flooded forest, and sandbanks. Their natural habitat is usually very acidic, and the water is stained brown from chemicals released by decaying organic material. Sporting an iridescent silvery white stripe contrasted by a black stripe beneath it, the black neon makes an excellent contrast fish to similarly shaped and sized tetras such as the rummy nose or neon tetra. They can readily be identified as they have an enamel-white to greenish neon stripe contrasted with a rich velvety black color below it. At an adult size of little more than one inch, black neons are suitable for small aquariums. They are a schooling fish and should always be kept in groups of a half dozen or more. They also make a nice addition to a larger community aquarium as they are peaceful and easy to care for. Neon tetras do well in a community tank as long as tankmates are not large or aggressive. They get along well with all sorts of other peaceful fish, such as rasboras, danios, gouramis, other small tetras, as well as corys and other small catfish. Avoid larger fish, as they will eat neon tetras at the first opportunity. The rule of thumb is, if the mouth of the fish opens large enough to swallow the neon, they will do it sooner or later. Like other tetras, black neons prefer soft acidic water; however, they are quite adaptable and are more tolerant of hard neutral water than some tetra species. Peat filtering is recommended for bringing out the best coloration, and it's essential if attempting to breed them. The ideal biotope for the black neon tetra includes subdued lighting, live plants, open space for swimming, a dark substrate, and a healthy water current in the mid to upper region of the aquarium where they prefer to swim. For the substrate, use a river sand with some driftwood and twisted roots. Add some dried leaves to the tank, which will stain the water a light brown. Replace the leaves every few weeks. Use dim lighting, it will develop the tetras coloring to give the best display effect. Black neon tetras are not exceptionally difficult to care for provided their water is kept clean. At least 25 to 50 percent of the tank water should be replaced every other week, especially if the tank is densely stocked. Because they are very active swimmers, it is also advisable to keep them in a tank at least 20 inches long and ideally 20 or more gallons. The tank should be securely covered as these fish are skilled jumpers and will probably do so if given the opportunity. Its natural diet consists of small invertebrates and plants, and most likely also includes crustacea, filamentous algae, and fallen fruits. Black neons are not demanding and will eat almost anything offered to them; however, they should be fed a varied diet for optimum health and color. Flake, frozen and freeze-dried foods are all suitable, as well as small live worms and brine shrimp. Sexual differences are not overtly apparent in neon tetras. Generally, the female will have a larger more rounded belly than the male. A female's stomach will get full of eggs when it is sexually mature. These fish are egg layers and freely spawn in schools or in pairs. Select breeding pairs from healthy adults that are approximately one year old. Younger fish may spawn, but best results are achieved in fully mature fish. Condition the breeding pair (or breeding group) prior to spawning with live foods such as brine shrimp and mosquito larvae. Choose males that are the most colorful. A breeding group should include one or two males with several females. Keep breeders in a separate tank to get the best number of fry. After spawning, remove the breeders or else the eggs and fry will almost certainly be eaten. While conditioning the breeders, keep the spawning tank at 75° F (24° C). After a few days, slowly elevate the temperature to about 80° F (26.7° C). The breeding tank should have very soft acidic water (4 dGH or less) and a dark substrate. Filtering the water through aquarium-safe peat will also encourage these fish to spawn. Fine-textured, live plants can be provided for a spawning medium, and floating plants will help keep the tank dim. A layer of mesh works, too, but make sure it is wide enough to let eggs to pass through but small enough to keep the parents out. A 10-gallon spawning tank is adequate. Lighting must be very dim. If the room is very bright, place cardboard on the sides of the tank to subdue the light. Spawning generally occurs early in the day. The female will scatter several hundred sticky eggs on the plants and/or substrate. The eggs will hatch in approximately 22 to 26 hours, and the fry will appear three to four days later. Fry are relatively easy to raise and may be fed commercially prepared fry foods, freshly hatched brine shrimp or finely crushed flake foods. Baby fish should be kept isolated until they are too large to be eaten.